One of India’s most stunning dancers, Padma Bhushan Dr. Padma Subrahmanyam, performed for Amma on the first night of Amritavarsham50. 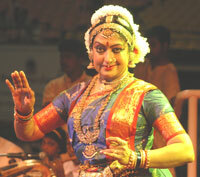 The award-winning classical dancer performed Bharata Natyam, portraying different characters from the Hindu epics and puranas. How long have you know Amma? “I could meet Amma physically only very recently. One year back, I met Her in Madras and later in Geneva. When Amma received the “Gandhi-King Award for Non-Violence,” I danced there on that evening. I think I was the first one to greet Her when She came off the stage. I really felt proud to be an Indian then. How do you feel that when you perform? What is your vision about Amritavarsham50? Yes, some people say we shouldn’t spend money for such celebration.